The old ways are changing, you cannot deny, and the institution known as the Irish pub is very much under siege. Its days as THE gathering spot for conversation and craic agus ceol is waning in part for sensible reasons such as drunk driving, and also because people would rather stay home and entertain themselves or friends without supporting the local taverns where the Irish gathered for years. Even more endangered are the family-owned pubs, where once a good living could be made for a family who served their neighbors and visitors alike and were an important part of their community. We all have stories of famous or not so famous establishments we have visited in our lifetimes that stay in our hearts and minds because of the Irish experience we received there, part of that great Irish trait called hospitality. And very often the publican set the tone for that welcome, which I was reminded of in the past two weeks with the passing of a great Irish pub owner in Baltimore, Maryland, Joseph Patrick Byrne, 82, much beloved in his adopted city for his very Irish bar, J. Patrick’s Pub. I only visited once the humble bar that anchored a corner on Andre Street in the Locust Point section of Baltimore, a neighborhood that was on the track to gentrification back in 2004 as the city was undergoing its own renaissance as an East Coast place to live. It was an historic occasion that happened to mark Dr. Mick Moloney’s first visit to the pub now famous as the Baltimore redoubt for traditional music and dance. Marty O’Malley who had his own Irish band for goodness sakes. On the day O’Malley (now governor and potential Democratic presidential material) told me how important J. Patrick’s Pub was as a community center, and how it had the look and feel of someone’s finished basement and a keg party among good friends. That occasion had many things to celebrate, but never lost amidst all the hoopla was the steady presence behind the bar, a man who was living his dream after a long career in the corporate sector. Joseph Patrick Byrne was born in 1930 and raised in Middleburgh, New York, an upstate town. He attended Syracuse University on athletic scholarships for football and baseball before joining the Navy and then returning to Siena College near Albany to finish his bachelor’s degree. An accountant by trade, he rose to the ranks of chief financial officer and CEO of Pharmaplastics before leaving it in 1985. 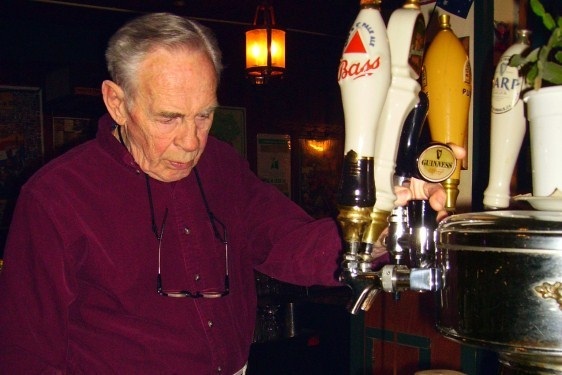 Two years later he opened the bar at Andre and Clement Streets, “a lifelong dream,” even living above the bar in the fashion of many Irish pubs in the old sod. From the time he was a youth in Middleburgh only 30 miles from East Durham the sounds of accordion music wafted out of the bars along with the lovely lilt of the female Irish voices, both of which inspired the dream. When the Irish wish to compliment someone they say he or she was “very genuine,” and Byrne was that in spades over the 25 years he operated the hostelry known as the home of Irish music and dance in the city . Traditional Irish music was the mainstay there. Sessions occurred weekly anchored by solid musicians like Billy McComiskey, Peter Fitzgerald and Laura Byrne and many others down through the years. On the second Sunday of the month was a monthly ceili. growth and standard of the scene around that part of Maryland. It became apparent to this long-distance observer that J. Patrick’s was a key cog in that evolution richly enjoyed today by many younger musicians carrying the musical banner forward. Byrne had a very certain idea of what he wanted his “Irish pub” to be. It was not for the Plastic Paddy bedecked in shamrockery. He would have no televisions, pinball machines or pool tables to distract customers from what he felt were the basic attractions there --great conversation and devotion to the music and dance taking place. celebrations of life and community. Pub to soak up the atmosphere along with the chunes. Now the director of the Baltimore Irish Arts Center for music, she fondly remembered Joe’s contribution to developing that cultural aspect of Irish life. “Joe had created a place where people of all ages can actually talk, listen to music, play music, sing, dance and make friends – that’s a precious gift that sadly is getting harder and harder to find in this day and age. Other pub music venues quickly come and go, but Joe is behind that bar every night making sure that J. Patrick’s remains a home for all of us,” she said. Needless to say, he could offer good food and drink at reasonable prices. Watching the one time accountant carry sums and bar tabs on a paper check pad with no sophisticated computer registers was a wonder in this day and age but spoke volumes about how he operated his business. Musicians often played in the pub on nights where there wasn’t enough trade to justify getting paid, but unlike many other stories told about publicans stiffing musicians ensuring both would have bad nights, Byrne would always tally up in favor of the musicians. Whether or not it is the end of an era there in Baltimore, the legacy of Joe Patrick Byrne and his iconic J. Patrick’s Pub cannot be denied. He was a valuable friend and patron really of an Irish music traditional music scene that prospered during the 25 years that he ran his place as he wished. The musical leader and guru in Baltimore, accordionist Billy McComiskey, a Brooklyn native who married and settled in Baltimore and raised his family there, has valued the long time friendship with Joe, and we’ll let him have the last word. “Joe had a good run. He was a good businessman, a good husband and a good father. It was always a good place for a tune and a get together. Places like that don’t grow on trees, and we could be looking for another one like it for awhile,” he said. I hope the search is a short one, and maybe it will even be there at J. Patrick’s Pub on Andre Street. But whether or not that happens, the life and times of Joseph Patrick Byrne the publican will never be duplicated because he was one of a kind and symbolic of what a difference one person can make. You can be sure he will be one of the welcomers at the Pearly Gates now because his was a life of service to his fellow man and community. So long Joe, and it was great to meet you.